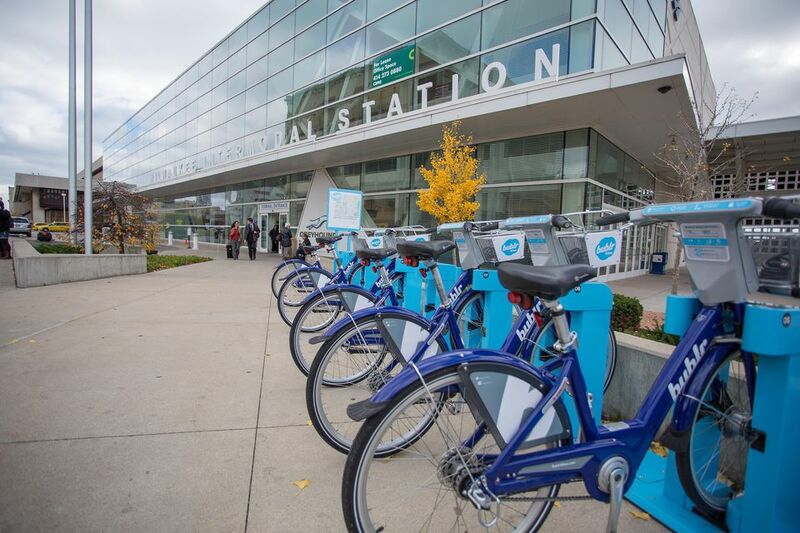 The Intermodal Station is an important transportation hub located in downtown Milwaukee. The station serves passengers using Amtrak train service, as well as Greyhound, Lamers, Jefferson Lines, Indian Trails, and Coach USA bus services. According to the Wisconsin Department of Transportation, more than 1.3 million passengers use the facility per year. Parking: A 300-space parking lot is located just west of the station at 460 W. St. Paul. Amtrak routes serving the Milwaukee area are the Hiawatha Service and the Empire Builder. The Hiawatha line runs between Milwaukee and Chicago's Union Station, with seven daily trips each way on weekdays, six daily trips on weekends. The Hiawatha train stops at General Mitchell International Airport, Sturtevant, WI, and Glenview, IL, before it reaches Union Station. The ride is usually about one hour and 30 minutes. The Empire Builder runs daily from Chicago, through Milwaukee, to Minneapolis, Spokane, and ultimately Portland or Seattle. The trip is at least 44 hours. For Amtrak information, visit www.amtrak.com or visit the Amtrak ticket counter at the Intermodal station. Tickets can be purchased on-site at the ticket counter, or at a self-serve ticketing kiosk. Greyhound buses serve Green Bay, Appleton, Madison, Chicago, and all points north, south, east or west from any of these connecting points. Greyhound does not directly serve Mitchell International or O'Hare airports. For Greyhound information, visit www.greyhound.com or visit the Greyhound ticket counter at the Intermodal Station. Coach USA buses travel from the Intermodal station direct to Chicago's Union Station, O'Hare airport, Minneapolis and several cities in Wisconsin. If traveling to O'Hare from the Intermodal station, your best bet is probably to climb aboard a Coach USA bus. The ride is about 2 hours, with stops at the domestic and international terminals. For Coach USA information visit www.coachusa.com or visit the Greyhound ticket counter at the Intermodal Station.